Every business, its people, its story, its culture, its mission, are different. And so should your landscape. Craft a business space with plants and trees made exclusively for you. Send out a strong, beautiful message about yourself and your business to the world by creating a visually spectacular commercial landscape. We have everything you need to realize your dream space. Every business space presents unique decorating opportunities. Our team will visit your space, evaluate it and come up with the most engaging recommendations based on your budget and personality. We've got landscaping solutions for every business. Whether you've been in business for decades or have just started, we'll help you plan and design your dream space. There's something about Tropical Trees which brighten up the mood to any work space. Our state-of-the-art facility will create the perfect tree for your office space based on light, temperature, and other factors. We're an all-under-one-roof landscaping company. No matter what your landscaping needs are, we have the right solutions, tools, and professionals to make your business space better, brighter, and appealing to your visitors. The highest quality interior landscaping design to make your space full of personality and distinctive character. Fade resistant & suitable for all weather conditions. We have a range of faux plants and trees designed specifically for outdoor use. 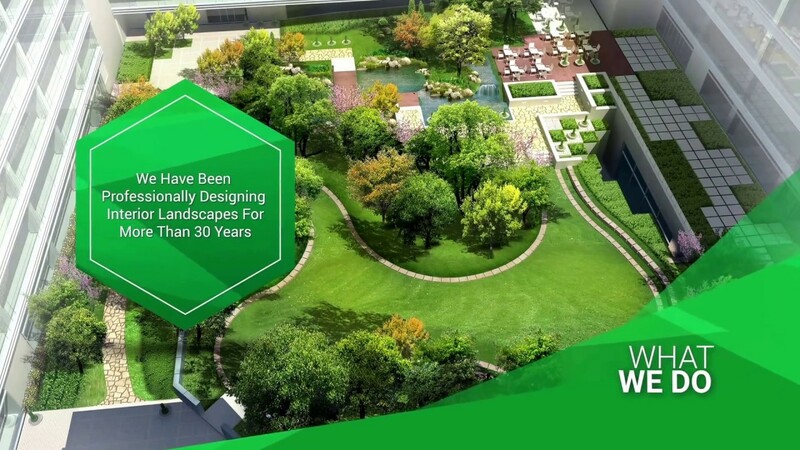 Over 40 years of experience in a diverse set of services in landscape planning and design. Whether it's the creation of custom plant arrangements and trees or the design of a perfect commercial landscape plan, our goal is to make your setting a better and livelier space. Our solutions and services combine function, quality, design and value which in turn, creates a landscape with a lasting impression. A custom made artificial plant and tree arrangement will enhance any interior space. We carry single stem flowers, bouquets, garlands, centerpieces, festive, and seasonal arrangements. A range of topiaries which are modern, cozy and sophisticated enough to impress. Decor your landscape space with some colors, freshness and natural elements. No matter how harsh the sun, wind, water, or snow elements may be, you can be rest assured that there won't be color loss or quality degradation. Fire retardant chemicals in its foliage and as such they offer complete resistant in case of fire outbreak. The beautifying aesthetic of the foliage will contribute to the overall polished look of your space. Ultra-stylish, compact, and minimal. Nature is an elegant solution to increase memory retention and concentration. We design and manufacture all our products in the United States and offer industry leading warranty on all of our products. Our plant installation crew will deliver the trees to your business space and will install them as per the final landscape design plan. We design our range of turnkey plant and trees solutions to make landscaping projects a breeze. What are the cost differences between live plants and artificial? In an office environment, artificial plants will generally have a financial payback of 10 to 13 months. Larger atrium size trees, 14'+ can have a longer 'break even' time frame. How can I make a decision between live plants and artificial? - Live plants are living office mates and change constantly. They create a vibrant environment that has been proven to increase productivity in the office. Live plants add oxygen and can cleanse toxins from the air. - Plantscape Inc. / Commercial Silk Int'l replica plants are the most realistic 'faux' plants available. Without a close inspection it is difficult to differentiate them from their live counterparts. They offer a long lasting, affordable alternative to the monthly fees associated with live plants. Live plants require periodic replacements while faux plants can have a useful life span of 7 - 10 years. What type of maintenance is required for artificial plants? Periodic dusting is all that is generally required to maintain the fresh appearance of artificial plants. If they can be dusted two or three times a year they will maintain their color and look new for years. If dust accumulation becomes a problem there are a number of silk plant cleaning products that are easy and environmentally safe to use. In extremely dusty environments, the plants and trees can be cleaned with a spray bottle of hot water. Why should we contract with Plantscape Inc. to maintain live plants in our office when we can buy plants at Home Depot and water the plants ourselves? A) Our plants are contract grown for us in controlled environments. These plants are much healthier and acclimated to lower light conditions that occur in most indoor spaces. National chain stores purchase plants that are grown as fast as possible and many times have a hard time adjusting to our Minnesota buildings. B) We are experts in caring for live plants. Many times we can diagnose problems with a plant and take proactive steps before the client notices any visible change. C) Our programs include periodic replacement of plants. Plants have a limited lifespan and can outgrow its space, become unsightly or have health issues that cannot be treated on site. We replace these plants most times without the client noticing. D) Your employees can be more productive for you performing their jobs as opposed to caring for the office plants. The result of utilizing employees to perform tasks they are not trained for can be reduced production and poor looking plants. Your artificial trees are a lot more expensive than trees I can get at a local furniture store? Why should I pay more money for your plants? We have been in the live plant business for over 40 years. The expertise we have gained in working with live plants transfers into creating the most realistic replica plants available. 'Furniture Store Plants' are usually built in factories overseas and shipped to warehouses. We build all our trees and plants per job allowing us to build virtually any size and shape. We design proprietary foliages resulting in realistic looking plants that are hard to distinguish from their live cousins. Replica plants are an investment. With proper care artificial plans can last up to 10 years with minimal maintenance. The difference in the cost of a 'Furniture Store Plant' vs a hand built, replica plant is pennies a week. Our major clients include Disney, Universal, Rain Forest Cafe, Bass Pro Shops as well as major health care facilities and restaurants around the world. We can stand behind the quality we build into every plant we produce. What type of programs are available with live plants? There are two basic plant programs - Lease and Service with Guarantee. The care and replacement of plants is identical in either option. the only difference is in the ownership of the plants. With a Lease Program you lease the plants. The initial cost with this option is less and the monthly fee is higher. This is our most popular program. The plants are purchase by the client in the Service with Guarantee option. although the initial investment is more with this program the monthly fee is less. Our expert advicer will figure it out, how to get it in real.